The Sandringham 14E is the perfect electrical cylinder mower that has been designed for keen home gardeners that have a small lawn to maintain but want to maintain an impressive aesthetic regardless. 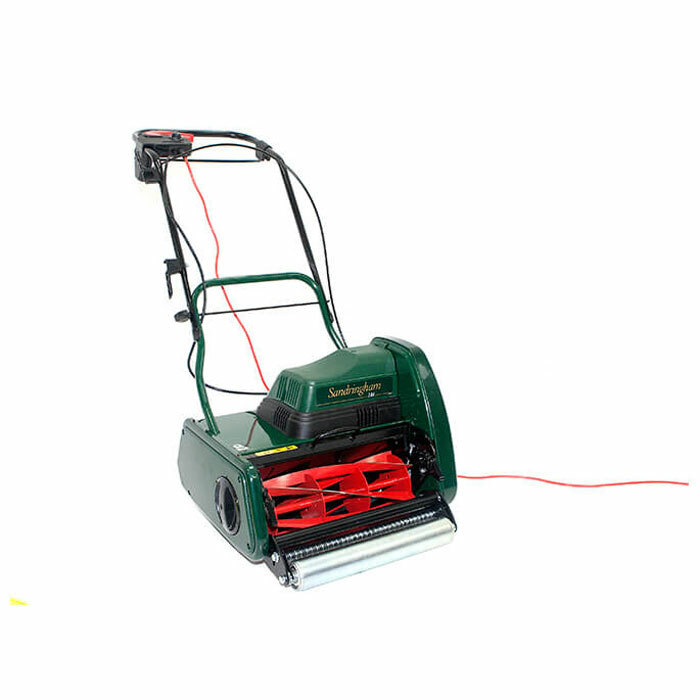 The lawn mower is a mains electric powered (420W) self propelled mower, perfect for achieving a pristine cut. The machine boasts a 35.6cm (14") cutting width, meaning it is capable of cutting larger surface areas more quickly than your standard mower. It is equipped with a 5 bladed precision cutting cylinder made of hardened and ground steel, complied of 5 curved blades to produce a scissor-like cutting action ensuring the cut is level and sharp. 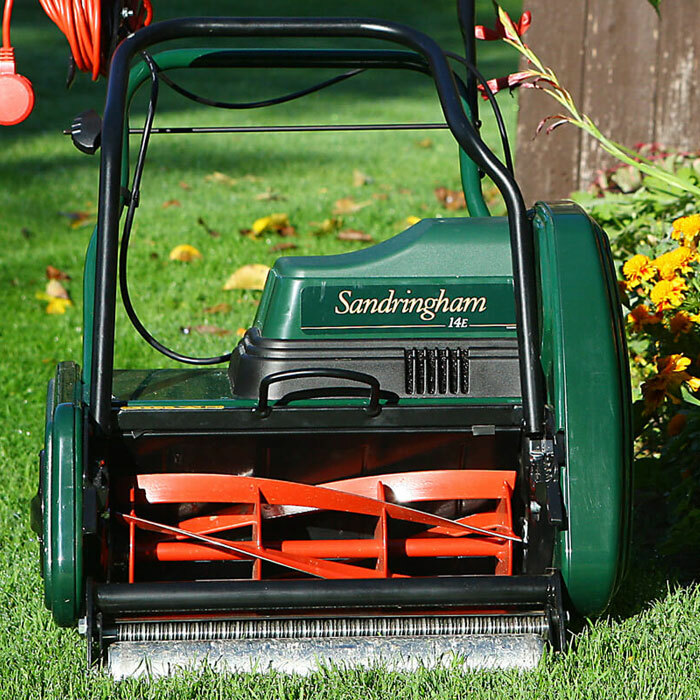 The Sandringham 14E’s cutting unit incorporates a static rake to tease and lift out dead material, moss and lateral grasses for improved cutting performance, whilst an optional powered scarifier cartridge can be fitted easily in place of the mower's standard cutting unit, along with an aerator and lawn brush in the same fashion. Handlebars have two height positions to enable ease of use, and it’s also able to be folded. The 32 litre large grassbox is made from sturdy polypropylene. 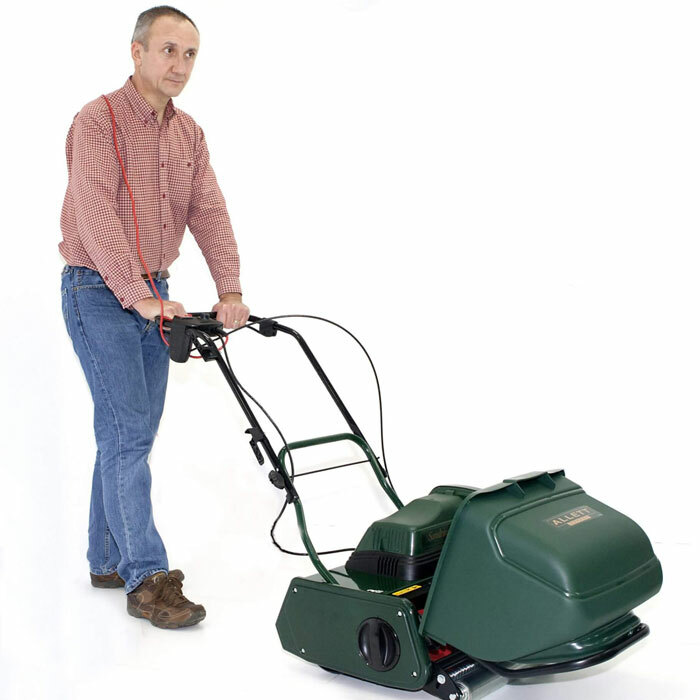 The machine is a total of 52cm (20.5″) in width, and weighs a total of 28kg with the grassbox. Overall Width 52cm / 20.5"